1) Suitable for food lyophilization processing in the area of vegetables and fruits, dietary supplements, instant food, condiments, biological product, medicine, beverage and etc. 2) Lyophilization is a dehydration method that to sublime the material containing water from frozen solid state to steam state directly under the vacuum and low temperature condition. 3) Microwave Vacuum Dehydrator is the most advanced dehydration technic in the world currently with the advantages of long period quality assurance, good-rehydration, good condition of the looking, flavor, taste and high content nutritious remains. The finished product has basically unchanged volume and shape with spongy appearance. 4) snack food microwave heating and sterilizing machine is easy storage and transportation. 5) snack food microwave heating and sterilizing machine have high automatic control with time and temperature adjustable operation. 6) snack food microwave heating and sterilizing machine have adopt the water-sealed pump and oil-sealed pump vacuum system, closed circulation heating system, postposition and bottom-position cold trap to make sure the efficient operation with equal quality. 7) Microwave Vacuum Dehydrator have extraordinary freezing efficiency is guaranteed by the extremely efficient evaporator, optimized design and quality finishing. articles . Also apply to drinks, tableware sterilization. small amount of transmission loss outside, almost no other loss, so high thermal efficiency, save energy. original colour and lustre and nutrition of food. heat and dust pollution; Neither polluting food, also do not pollute the environment. 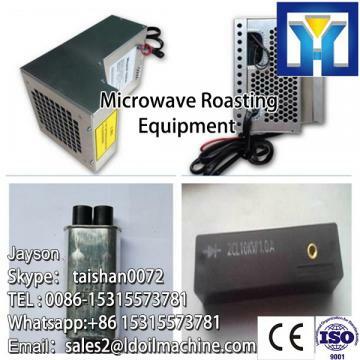 Snack food microwave heating machine. (Tel/whatsapp:0086-18363092712, Email:sales2@ldfoodmachine.com,Skype:leaderfoodmachine2).Welcome to send us your enquiry about capacity for snack food microwave heating and sterilizing machine, inform us raw material you want to use for snack food microwave heating and sterilizing machine,and specific requirements for snack food microwave heating and sterilizing machine.Shandong Leader Machinery Co.,Ltd. will provide you best solution for your project about Microwave Vacuum Dehydrator. * Working flow layout of equipment for snack food microwave heating and sterilizing machine. * Plant layout of equipment. * Layout drawing fro related pipe lines. * Packing for equipment and domestic transportation. * Equipment installation and commissioning. * Training for operation personnel. * Operation manual of equipment.